CAIRO, Egypt (CNN) -- The Egyptian government has unexpectedly released one of the country's most prominent dissidents, Ayman Nour, who was jailed more than three years ago despite widespread national and international objections. 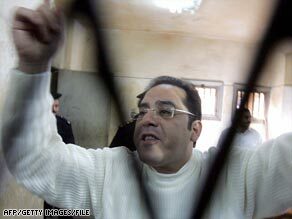 Nour reacts after being convicted in December 2005. Eight other dissidents and Nour, head of al-Ghad Party, were released Wednesday for health reasons, according to a member of his party and to Egyptian state-run media. Government-owned al-Ahram newspaper reported that the decisions were made based on a medical committee's report. Wearing a black suit and an orange tie, Nour -- an insulin-requiring diabetic who also has a heart condition -- told reporters that his release "was a complete surprise." He said he was put into a car but was not told he was about to be driven to his home. "Only halfway through the ride did I know where I was going," he said, adding that authorities had not discussed his release with him nor was he aware that anyone might have negotiated on his behalf. In September 2005, Nour placed a distant second to President Hosni Mubarak in Egypt's first contested presidential race. In previous elections, Mubarak had been the sole candidate nominated by parliament, and voters could only cast yea or nay ballots. Months after the election, Nour was sentenced to a five-year prison term for a forgery conviction -- a move criticized by his supporters as trumped up and politically motivated. At the time, the Bush administration expressed concern, saying his imprisonment "calls into question Egypt's commitment to democracy, freedom, and the rule of law." Nour, who spent most of Wednesday in interviews, told reporters he hopes his release "is a conciliatory step towards a national dialogue for a better Egypt." But his wife Gamila Ismail, who campaigned tirelessly for his release, was more cautious. "You can never tell what is going to happen in the next minute," she told CNN in a telephone interview. "You cannot even say that he is going to be free forever." Despite her happiness over his release, "I really wish that what happened with God's will today would happen to thousands and thousands of other [jailed] people who are suffering in this country," she said. Ismail said she learned about Nour's release when her housekeeper called her at work and told her that he was at the door and had no key. When she arrived 15 minutes later, "my kids had opened the door and I found him praying." Ismail said she believes his release was politically motivated. Nour told reporters he felt the same way. "I have no proof, though, but I expect that there are political signs which led to the decision. Or some political authority that called for it." Some analysts speculate that Mubarak released Nour as a gesture of goodwill toward U.S. President Barack Obama, whose call for change Nour supported last year in a letter to the candidate, according to Egyptian news reports, including those of government-run outlets. Mubarak has not visited the United States since 2003, when tensions heightened between Cairo and the Bush administration over the Iraq war. Since the 1980s, Cairo has received about $2 billion per year in U.S. aid, including about $1.3 billion in military assistance and services. Last year, Congress for the first time put conditions on the aid -- demanding it be withheld until Cairo implemented judicial reforms and curbed human-rights violations. But then-Secretary of State Condoleezza Rice waived the restrictions. Since last month, Egyptian government-run news media have been reporting that Mubarak plans to visit Washington in April "to congratulate the new U.S. president." Though Nour has been banned from seeking political office again, he spoke Wednesday of "rebuilding" his al-Ghad Party. His wife was not enthusiastic. "I am not sure if he knows how serious the situation is now," she said, adding that she was afraid such efforts could result in him being sent back to prison. Neither Nour nor Ismail expressed gratitude to the Egyptian regime for his release. "Whoever released my husband is the reason he stayed in jail for three and half years," Ismail said. "So I do not and I cannot have gratitude whatsoever for someone who harmed him, us and everyone around us and suddenly decided to be nice." CNN's Housam Ahmed in Cairo, and Amir Ahmed and Octavia Nasr in Atlanta contributed to this report.